I had a frustrating RSI week and am trying to limit typing and knitting (note: finding activities to do that don't exacerbate existing RSI pain and overdoing them until everything hurts is not a great coping strategy!). But! I have some things to show off that I am pretty excited about and maybe you will like them too. These were my happy-funtimes projects in December, and I loved having them to work on intermittently while I was also tackling my challenge socks. Thing 1 is quick-to-knit ruched socks with a springy DK-weight superwash merino! Knitscene named them Clandestine Socks, I hope because of the tiny lace at the cuff edge which is totally hidden if you're wearing pants. 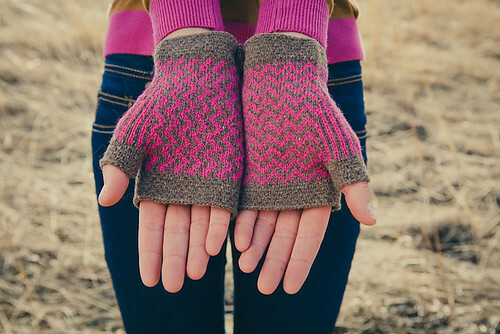 Thing 2 is Wellington Mitts, small fingerless gloves that just reach the wrist. The stranded colourwork pattern zigzags differently on each hand; I hope they'll appeal to people like me, who tend to like knitting things that come in pairs but hate knitting the same thing twice. Harrisville New England Shetland is, as always, fabulous yarn for colourwork. These guys are on the cover, and I am delighted because I thought they were very cute and they were a lot of fun to knit. The magazine was just made available for digital download and preorder; it'll be on newsstands at the beginning of June. love those mitts, they're adorable! Wow, on the cover! Both patterns are very cute! Beautiful! I totally love the idea of knitting a pair of something that aren't identical.